My laptop is on its last legs. I guess I've know this for awhile, as it started to move more and more slowly. Calling up papers to grade takes extra seconds to download. And when there are 100 papers, those extra seconds add up. I can't remember how old my laptop is, but somewhere around 4 or 5 years old. I think that's pretty good for a laptop, which sometimes has the life expectancy of a squirrel. 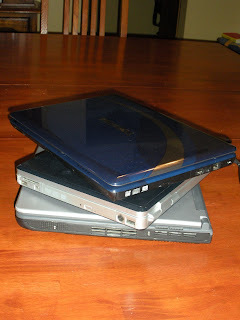 I wrote three years ago about how many laptops I've had to buy, so apparently they've gotten a little more reliable. In 2009, this one went to the shop for a complete overhaul. Now it's showing similar signs of aging. Back when it was healthy, I could have 5 or 6 windows open and switch between them, along with having music or NPR playing. Now the computer balks, as if it can only think of one thing at a time. I click on email and it pauses as if wondering, "Now where did I put that?" 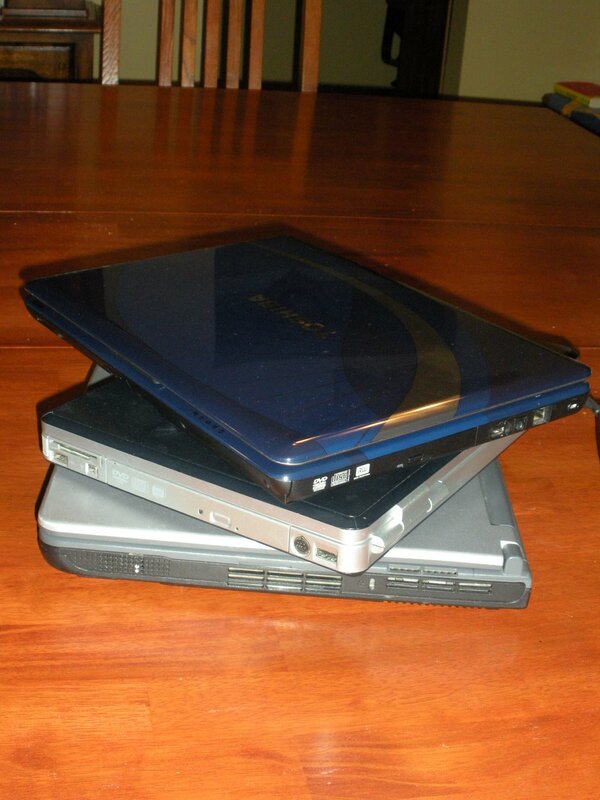 A stack of my laptops that had died in 2009. Along with slowing down, the computer has started to overheat. I have my own remedy for that. I vaccuum the vents to try to remove dust and cat hair or whatever else might be causing it to overheat. This time, that did not solve the problem. As I'm typing, I can feel my left hand getting hotter as the heat from the computer vent rises. I remove my hand as often as possible, both to help the computer and to help the hand cool down. One day last week as I was trying to finish grading papers, the computer got so hot that it shut down -- making that little zzzeee noise that it does then going black. If you've ever had a computer spontaneously shut down, you'll know what I mean. So I started working on my computer in small bursts. Half an hour here, half an hour there. I put it to sleep every time I walk away from it so it can cool down again. Yesterday after work, I woke up the computer to check my email, check my blog and saw the final sign that my computer is dying. The clock is off. It's not like the clock has moved to another time zone, telling me West Coast time or even France time. No, the clock is off by 35 minutes. That is such a startling time mistake for a computer. I'm kind of embarassed for it. So now, although it's 5:57 a.m. according to my healthy cell phone, the computer says 5:22 a.m. The clock is one of the most basic computer features, if it can't keep up here, well I think this computer may be headed to the computer rest home to chug along with the other computers that remember the day when they were the fastest and the best, and when they never lost track of the time. I'm not in a panic though, afraid of losing all those photos and teaching plans. Because I have Carbonite. I don't want to sound like some kind of commercial, but Carbonite is a backup plan. I pay $59 for the year and if I buy a new laptop, because mine dies or just because I want to, Carbonite will download all my old files to my new computer. So go ahead and overheat, little computer, but first, let me check my Quicken account to see if you've stashed any extra money that I can use to buy a new laptop. 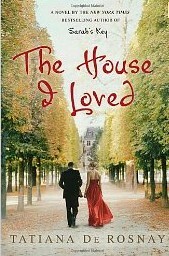 This week I'm starting The House I Loved by Tatiana de Rosnay. Paris, France in the 1860s. How can it go wrong? Here's the first paragraph. I can hear them coming up our street. It is a strange, ominous rumble. Thuds and blows. The floor aquiver under my feet. There are shouts too. Men's voices, loud and excited. The whinny of horses, the stamp of hooves. It sounds like a battle, like in that hot and dreadful July when our daughter was born, or that bloody time when the barricades went up all over the city. It smells like a battle. Stifling clouds of dust. Acrid smoke. Dirt and rubble. I know the Hotel Belfort has been destroyed, Gilbert told me. I cannot bear to think about it. I will not. I am relieved Madame Paccard is not here to see it. Well? What do you think about the opener? So what is it, pray, that I hoard down here with me in a battered shoe box? You are longing to know, are you not? Well, letters! Precious, precious letters. A dozen of them or so, letters that mean more to me than outfits. Your first love letters to me. Yes, I have kept them preciously, for all those year. From Maman Odette. From Violette. From...I will not say his name. I cannot...From my brother, from the Baronne de Vresse, from Madame Paccard, from Alexandrine. Well, I'm not so sure. Maybe it's the translation. The fact that the letters mean more to her "than outfits" is not too encouraging. Sounds like she may be a little shallow. And I don't like that she keeps the precious letters "preciously." I'll probably give it a try. I'm not good at hosting parties. Some people are. I can plan the party, but I'm kind of dreading it the whole time. I can make the food, clean the house. I have a husband who works hard to trim the yard and hang plants. He sets up tables and canopies. Still, I have this feeling of dread within. The whole time, I can't wait for it to be finished. If I'm having a small party with friends, I enjoy it while they are here, but I still dread it ahead of time. For a big party, like the graduation one, I don't even enjoy it in the middle. There's always ice to get from the freezer, coolers to restock, pasta salad to fill from the bowl in the refrigerator, sangria to pour in the bowl from the refrigerator. I try to greet everyone but feel like I have no quality time for anyone. All of those things make me a bad hostess. We held Spencer's graduation party with two other families. One of the families has twin boys, so we had a total of four graduates. We estimated 130 people might come. I think we had more than that. The day was incredibly hot -- in the 90s. Although we took no pictures of the graduates or their friends during the party, for some reason, we got a shot of the window thermometer to remember how hot it was. Before the party, the house was a chilly 72. Once people started coming in and out of the doors, and the house filled up with people, the air conditioner worked non-stop but couldn't cool things off. 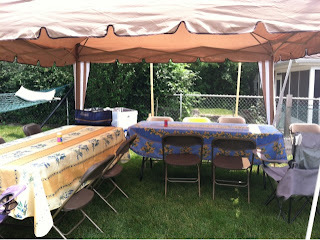 Outdoors, we had canopies and fans that mist along with a spritzer to stand in. We blocked off the alley behind our house and had beanbag games, along with hula hoops and sidewalk chalk. I never even made it out to the alley. One of the dads is a chef. He cooked chicken wings in a deep fryer outside, along with grilling burgers and hot dogs. I hugged people who I didn't know and welcomed people who wouldn't have spoken to me in public. 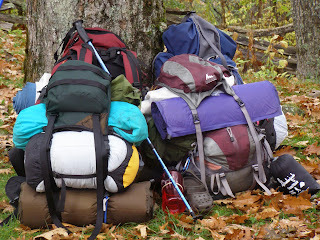 At one point, the house was so crowded with high school students that a boy standing by the back door lamented, "I have to get all the way to the front door to leave." It probably took him a good 10 minutes to get through the crowd, and our house is small. It was only later, as I was sitting in the living room with my brother, sister-in-law, niece, and my daughter Grace that I realized, I didn't take a single picture during the party. I can't believe it! I did get a shot of the four graduates before the party started. Here they are. Hayden and Spencer, the two on the left, are best friends. Jacob and Tyler, the two on the right, are best friends. Hayden and Tyler are twins. Thus, four grads, one small house and a crowded party. 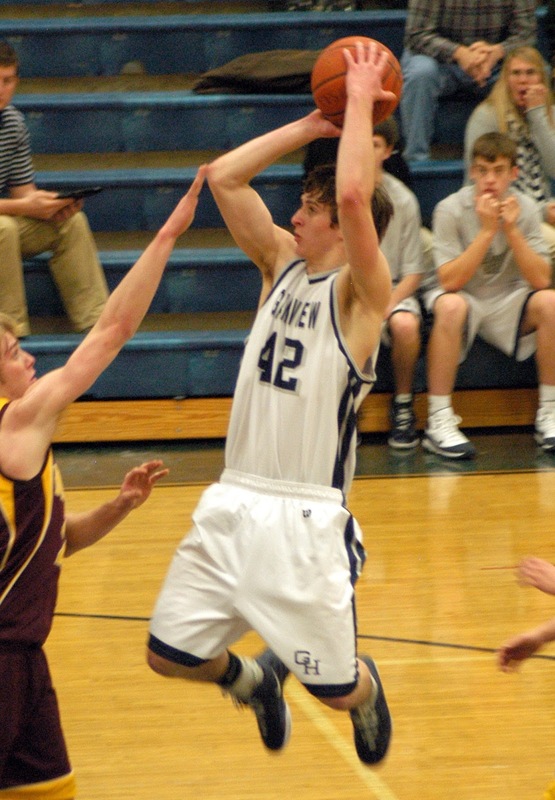 Since Spencer graduates from high school tomorrow, I thought I'd post a few pictures of him. Spencer is probably 3 in this picture at the Miami, Florida zoo. Here he's ready for his 5th birthday party when we lived in Michigan. Spencer as a senior playing basketball. This is just a snapshot of his senior picture, so the quality isn't too good, but you get the idea that my sparkle-eyed little boy has turned into a man. The other day, I went to Noodles & Company to buy the kids dinner before I taught an evening class. 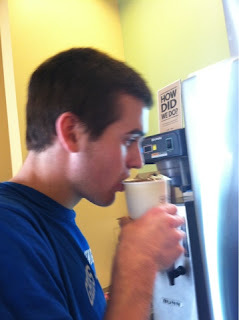 As I was leaving home to get the food, Tucker called out, "Will you get me a drink from their fancy drink machine?" 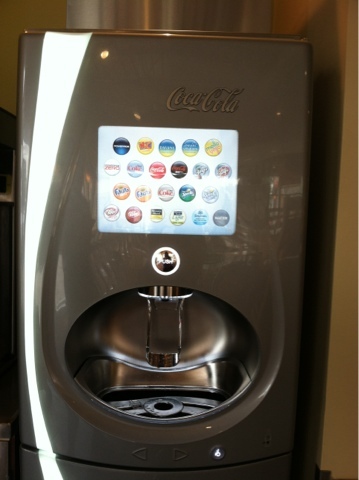 This machine has a touch screen with lots of different drinks on it. Dasani, Dasani Sensations, Fanta Orange, Mello Yello, Dr. Pepper, Barqs root beer, Powerade, Sprite, Seagrams Sparkling Seltzer Water, and, of course, Coke. But that's not the end of it. Coke Cherry Vanilla, Coke Lime, Coke Raspberry, Coke Vanilla, Coke Orange or Coke Cherry. He pressed on his choice and then pushed the black button at the bottom. His cup filled with the Coke of his choice. 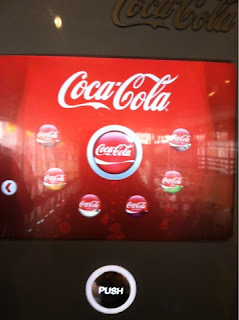 I should have explored more to see if every flavor of pop had as many choices as the Coke did, but I was just amazed by this machine. Finally, something similar to what the Jetsons promised us back in the 1970s. Tucker said he saw a machine like this in New York City when he travelled there over Christmas with his friends. So Columbus is behind the times, but I'm still pretty impressed. When we're out in public, Tucker says don't take pictures of stuff for your blog, but here he is anyway, enjoying his fancy soda. I know I must be in denial because I'm not waking up in the middle of the night worrying about the graduation party that's happening at my house this Saturday. It's not just a party for Spencer; it's for four boys. Two years ago at this time, I was in a fully tizzy for Grace's party. I'm pretty sure I even took some time off work to make sure everything got done. This year, I accepted some substitue hours for Friday morning. I have done nothing for the upcoming party. I haven't started cleaning. I don't have lists of tasks to accomplish. I don't have lists of ingredients for food. I have ordered a bakery cake and sent out invitations. I think part of the problem is that I'm throwing the party with two other moms. Two of the boys are twins, which is why we end up with four graduates. I must be feeling like they're going to take care of things. But I know they won't clean my house, so what am I waiting for? Make a list of ingredients for the pasta salad. Check to see if I have enough plates and silverware. Wine!! I need to buy wine and make sangria. Better get some pop, cause the 18-year-olds don't get to drink wine. Stop by Sheila's house for the canopy I'm borrowing and drink some wine. What else? Somebody had better help me get ready for this party. 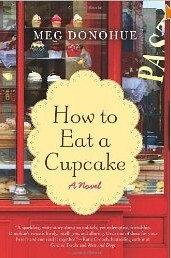 This week I'm reading How to Eat A Cupcake by Meg Donohue. I love the cover because it reminds me of the cover of one of my favorite books The Dressmaker by Elizabeth Birkelund Oberbeck. I know there's a new book out called The Dressmaker, but I haven't read that one yet and I can highly recommend the one by Oberbeck for some delectable writing. Both the covers of The Dressmaker and How to Eat a Cupcake have the same shop window with red trim. Only this time instead of a wedding dress, the shop window has cupcakes. Here's the intro to How to Eat A Cupcake. People frequently make the assumption that I'm unreliable. I chalk this up to the fact that I'm perhaps a bit too creative and flour-flecked in my dress, and I'm not a hedge fund manager, dot-com entrepreneur, or lawyer. Oh, and my hair is curly, which I guess pegs me as unpredictable. Hair, apparently is the new window to the soul. I like this opening, but I'm two-thirds into the book and the opening doesn't seem to go with the character at all -- except she has curly hair. As an author myself, I kind of picture the author coming up with this opening and sticking with it even as the character evolved. Anyway, I'm enjoying the book. Do you ever pick up a book you want to read and then something puts you off? That happened to me when I began The Reading Promise by Alice Ozma. 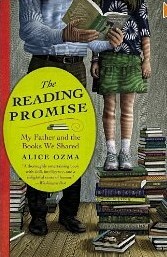 The book focuses on the author's pact with her dad to read together every day and how the ritual changed their lives. I read to my kids all the time when they were little, and my parents read to me, so I knew I would be able to relate to the book. My mistake was reading the foreword. Who even reads the foreword? I should have skipped it. The foreword was written by the father who read daily with his daughter, now in her early 20s, until she left for college. The father, Jim Brozina, told his version of how the daily reading plan began and then espoused the many benefits his daughter received from being read to by her father. At the end, he sums up how important reading together is. Okay. There was a time when I was more judgmental about parents and kids. As Grace reached her high school graduation, I was feeling a bit smug about our relationship and how she managed to stay out of trouble. Some grandiose temper tantrums during her preteen years were the extent of the drama she caused our family. I might have even been able to write the words written by Brozina. Obviously, the other parents were doing it all wrong. However, Grace was my first child, not my last. And since then, I've discovered that even good parents have kids who get in trouble. I was wrong when I judged parents whose kids took a wrong turn. That becomes more obvious when parents raise all their kids the same way and some of them find trouble while others stay on the straight and narrow path. My boys have chosen to rebel. They aren't in trouble with the law or anything, but they find typical teenage activities to occupy them and keep me awake at night. Luckily, I can learn from Brozina's words and examine myself to see which of the many characteristics he has that I'm missing. Maybe not enough compassion and understanding? Too little patience and love? Perhaps I never wanted to help them fulfill their dreams. Unfortunately, (?) my boys, who I read to, are still close enough to me that they inform me of their rebellious activities, which only causes me to lose more sleep. As someone who spends her days trying to make sure my kids can go to the college of their choice and enjoy the extracurricular activities that will make them well-rounded, along with providing them a house in a good school district and healthy meals, I don't think I'm going to criticize my own parenting. Instead, I'll put down The Reading Promise and move on to another book. Since last September, I have been without a dishwasher. That means, my sink has been full of dishes for eight months. 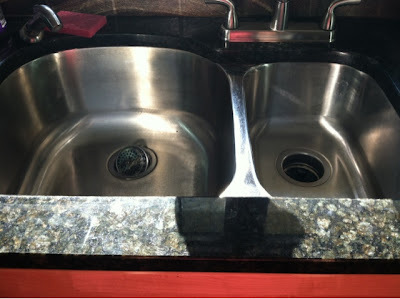 No matter how often I washed dishes, turning them upside down to dry on a dish towel next to the sink, someone else would need a drink of water or a bowl of cereal or a grilled cheese sandwich, and those dishes would go straight back in my sink. 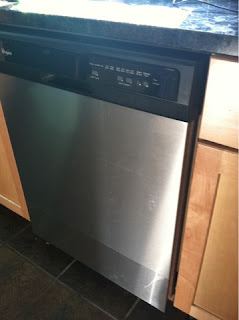 I complained before about the new dishwasher in our house when we moved in four years ago. As a matter of fact, I called that post "The Worst Dishwasher in the World" and I still stand by that. The dishwasher never worked well, so when it quit working in September, we didn't even think about fixing it. We waited out college payments and study trips abroad, tax payments and fixing the dent in the side of the car after it got hit in a parking lot and no one bothered to leave a name. Then finally, in this brief respite between college payments, we had the car dent fixed and, after much research, I dragged Earl into an HH Gregg where we picked out this sleek and lovely dishwasher. It isn't top of the line, but it washes the dishes, which is more than I can say for the previous dishwasher. And it's stainless steel, so it matches the rest of the appliances in the kitchen. Yesterday, Earl spent the day installing it while I got a haircut then went to a track meet. When I got home, the dishwasher was humming along nicely. I took the opportunity to clean the sink and prepared to remind my children, who have been happily dumping dishes in the sink for months, to place them in the dishwasher instead. I'm so happy! Hope something good happened to you this weekend. I can't believe you'll top the new dishwasher though. This week, my second child officially finished his high school classes. To celebrate the last day for seniors, the parents and other students line up and the seniors process through them. Here's Spencer and one of his good friends, Hayden feeling the freedom. Then they walk to the football field and release blue and white balloons. I'm not sure if the balloons are supposed to be symbolic of their newfound freedom, but a number of parents said they got choked up. I didn't get to go, but my husband captured this photo. 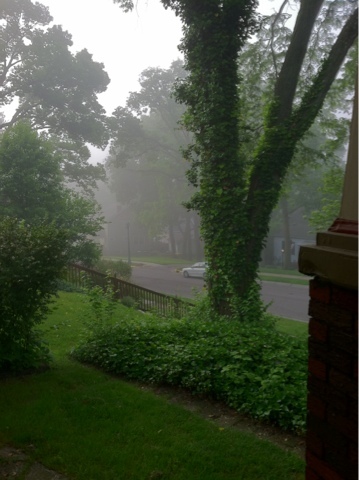 The other morning we had fog. When I stepped out onto the porch to get the newspaper, I felt like I was in Jurassic Park. The air was all thick and prehistoric. Plus everything is so green from our front porch. The hollyhocks are growing tall with hand-sized green leaves stretching over the edge of the porch. A couple of lavender bushes peek over the front of the porch. The ivy rolls down the front hill toward the rock walled garden that edges the sidewalk. And when I looked down at the garden, I was pleased that even though most of the irises have finished blooming, I could still see color. Columbine in purple and yellow dripping down. A green shoot stretched toward the sky with tiny white bell flowers dripping down from it. And then I saw a color that I didn't expect to see it. It was another garden surprise, like the one last year where I had planted gladiolus bulbs the autumn before then forgot about them. So when the gladiolus bloomed, they thrilled me. They sprang up in such a variety of colors. 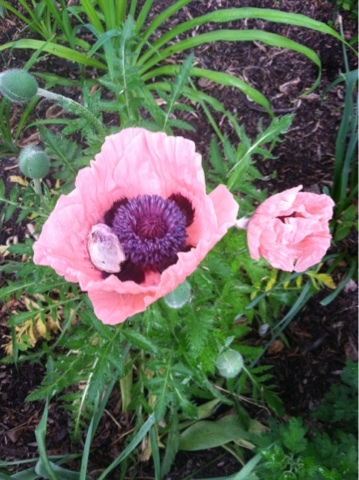 I ventured down to the garden, knowing it was too early for the gladiolus to make their appearance, and there I saw a delicately cupped poppy in the most gorgeous pinky-peach color, and other green bulbs on the stem were ready to burst into color too. I was thrilled. Look at the purple inside. The picture doesn't do it justice, so you'll have to take my word. And I had just been wondering why I didn't have any poppies in my garden. They add so much color. I guess I planted these last year. Good thing my memory is going, so the garden can keep surprising me. 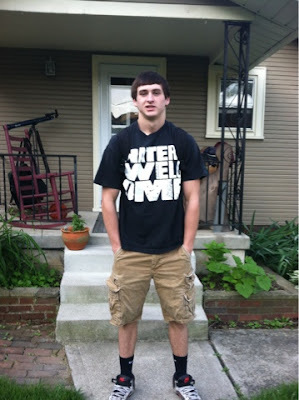 Today, my second child headed off for his final day of high school. He is ready to be finished. At the end of the school day, the seniors will file out between lines of parents and walk to the football field where they will release balloons. I won't be there since I have to teach, but Earl will and, hopefully, he'll get some photos. I don't feel sad about Spencer graduating, but maybe a little sentimental. He only started school five years ago, as an 8th grader since we homeschooled until then. 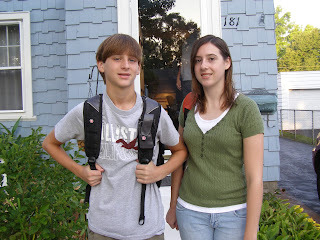 Here he is with Grace on their first day of "real school." I remember how nervous they were. Funny to see that he still hasn't mastered the ability to smile for a picture. Oh, well. Maybe for college graduation. Giles L'Etoile was a master of scent, not a thief. He had never stolen anything but one woman's heart, and she'd always said she'd given that willingly. But on this chilly Egyptian evening, as he descended the rickety ladder into the ancient tomb, each tentative footstep brought him closer to criminality. The perfumer smelled death and history. Faint whiffs of tired flowers, fruits, herbs, and woods. Most of these he was familiar with -- but he smelled other notes, too. Weaker. Less familiar. 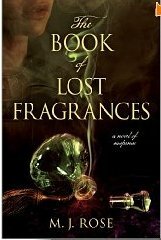 Only ideas of scents, really, but they mesmerized him and drew him forward, tantalizing and entreating like a lovely dream on the verge of being lost forever. I really like the writing so far. Continuing with my obsession for all things French, I picked up the book Paris in Love by Eloisa James. I'm not sure why it was called Paris in Love unless it's because the author writes romance novels. The book was mostly like a series of tweets on Twitter. I mean, not that I'm on Twitter, but it was made up of a series of short snippets about the author's life as she and her Italian husband, plus two kids, a 15-year-old and 11-year-old live in Paris for a year. Okay, first we have to get over the resentment that they have the kind of jobs that allow them to simply take a sabbatical and move to Paris. They both teach at American universities. The author also tries to make us not feel so bad about her lucky life by beginning with her breast cancer and her mother's recent death. It's hard to begrudge someone a year in Paris after they've been through those hardships. Many of the "tweets" just set the mood in Paris. Well, I enjoy chocolate and I have stood in front of that exact window. Isn't it funny how we love finding things we know in a book? 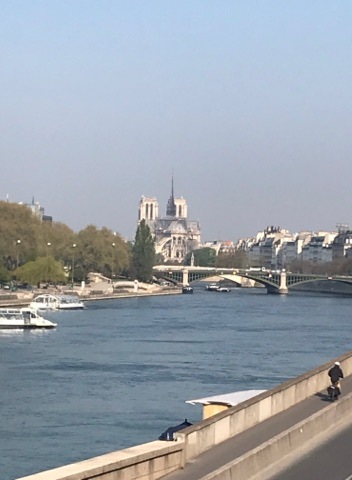 So, I enjoyed the book and seeing Paris through Ms. James' eyes. The book cover and title bugged me though. The title, I already explained. The cover problem. The family doesn't have a dog. Well, it had a chihuahua but the Italian mother now has it, and the dog on the cover is not a chichuahua anyway. Don't let these little details get in the way if you want a vicarious year in Paris. The irises are in full bloom at my house. Many of them have simply fallen over on their long stems. These irises came from my mother's house in Kentucky. I'm not sure where they might have been planted before then. She lives in Florida now and the irises do not like the climate there, so I thought I'd send her one on my blog. The irises are just one of the gifts she has given me that continues to bloom every year. I drove 20 hours on Thursday to pick up Grace from school and bring her home. She goes to school in North Country New York, which means she's almost in Canada. I was struck by the way the trees were just beginning to get their leaves. Of course it was raining. Every time I've ever driven there, it was raining. I was going to write something poetic, like the green leaves are barely a breath of spring on the branches. Here, from my car window covered with rain is a shot of a small town storefront and the trees showing signs of spring. I look forward to seeing your Saturday Snapshots. I'm in the middle of a perfect storm -- for me. A triage of circumstances have gathered to increase my stress. The first prong in my perfect storm consists of being annoyed and snapping at everyone -- friends, family, students. I'm beginning to suspect menopause, although I haven't had any of the other outward physical signs. The second edge to my perfect storm comes from the fact that I can't run right now. Running is obviously a stress reliever. 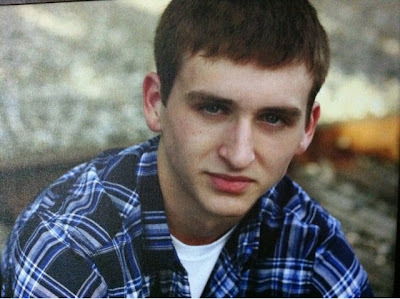 The third corner to my triangle of stress comes from watching a second kid getting ready to go to college -- but it isn't the departure that worries me; it's the bills that have already started piling up -- senior pictures, senior grad party, college deposit, college payments. If I wake up in the middle of the night, I have to avoid thinking about money or I'll never get back to sleep. I'm so vulnerable right now to falling over the precipice, that when I received an observation report from work, I didn't open it. I just feel like any "constructive criticism" might be too much for me. I'll wait til I'm in a better place. You appear to be a talented writer and I admire the dedication and energy I could sense from your letter. And this was just a query letter, not even my novel. Yes, in the end she didn't accept my novel, but I appreciate that she took the time to build me up a little first. I got another ego-building email from a man I met at the writing conference this weekend. My husband would probably say I'm naive and the guy was flirting with me, but I like to think his flattery was genuine. I hope you get to do a pitch face-to-face; you come across so great in person: winsome, so likeable, but quick-witted and assertive. I'm terribly curious about your book and wish you could write full-time! I don't think I've ever been described as "winsome." It seems young -- like anything is possible. So maybe I'll forget about the whole menopause thing and concentrate on being winsome, even if it's only retired psychologists who think so. 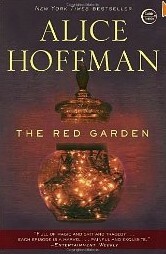 This morning I'm planning to start The Red Garden by Alice Hoffman. Here's the first paragraph. The town of Blackwell, Massachusetts, changed its name in 1786. It had been called Bearsville when it was founded in 1750, but it quickly became apparent that a name such as that did little to encourage new settlers. True, there were nearly as many black bears in the woods then as there were pine trees, but there were also more eel in the river than there were ferns sprouting on the banks. You could stick your hand into the murky green shallows and catch half a dozen of the creatures without using bait. If you ventured in waist-high, you'd be surrounded in moments. Yet no one considered calling the village Eelsville, even though people ate eel pie on a regular basis and many of the men in town wore eelskin belts and boots. They said wearing eel made them lucky at cards, but when it came to the rest of life, love for instance, or business acumen, they had no luck at all. It shocked her to see him disappear beneath the ice. Mary made a gasping noise even though she wasn't the one who'd gone under. She felt that her heart had stopped. I've liked Alice Hoffman before, so I'm sure I'll give this a try. What are you reading? I went to a writing conference on Saturday. One of the sessions was about inspiration, led by Hannah Stephenson of The Storialist. She's a poet, which a lot of times I don't get, but she inspired me in the session. I liked her idea that inspiration is a muscle and the more we exercise that muscle, the stronger it gets. Inspiration begets inspiration. And, I have to admit that writing in my blog makes my voice stronger, even though I have a friend who complains that my fiction voice is not as strong as my blogger voice. Of course, on my blog, I'm writing as the character of me. This is a character I know pretty well by now. Stephenson suggested that writers, or creators of anything, set "ambitious goals" of what they will create each day or each week. She writes a poem every weekday. So I set a goal of writing for an hour each morning. Then I promptly got up and graded papers for two hours this morning rather than writing. I also liked Stephenson's idea that many of us feel like we have to support our partners, our children, our careers, but we don't necessarily support ourselves. If creating fiction or art is part of us, then we have to "show up" for ourselves and not let down that inner part of us. I guess that's true. Other commitments take priority. One of Stephenson's ideas was to take inspiration by simply noticing the mundane around us. Notice it and think about what makes it interesting. She finds inspiration in the grocery story, overheard conversations, and mostly art. She gave us a chance to try it too. In a piece of art made from cut and folded paper silhouettes, in a huge, sunlit room, children danced around a May Pole. And I noticed the shadows cast from the long ribbons around the pole. Then I began to connect the idea of shadows to a new novel I'm working on. Most of my inspiration for writing comes from my daily life, slogging through work and motherhood and wifehood and friendship. Sometimes just a walk in the morning might inspire me. Many times I push that inspiration aside, put my head down and continue to push ahead with the things that must be done. So part of my inspiration must be allowing myself to stop and soak in that inspiration before noting it on paper and incorporating it into my work. What about you? What inspires you and how often do you feel inspired? Today I'm running off to a writing conference and I just remember to post a photo before I go. So I had to go with the fallback photo: Cat with big eyes. I took this photo last Saturday night and texted it to Tucker, telling him the cat needed him to come home so he had someone to sleep with. Tucker didn't fall for it and spent the night at his friend's house instead. This morning, I am going through one of my novels changing it from present tense to past tense. I'm not sure why I wrote it in present tense. It just came out that way. But it was something that agents commented on. Things like, "Some readers aren't comfortable with 3rd person present tense." I always just moved on. Too bad, I thought. Then recently it hit me. I could change it to past tense. And that's what I'm doing. I'm only on page 51, so this may be a long, tedious process. This is the book about the two women who decide to hike the Appalachian Trail as the ultimate diet plan and as an escape from their almost-adult children who come home for the summer. The women use their time on the trail to figure out what their lives will look like without the day-to-day job of raising children. As I'm making my way through though, I found this sentence which I liked and thought I'd share with you. The trail snaked across the mountains, a mere comma in the middle of a sentence of unending trees. Hope you find a gem in your work today. 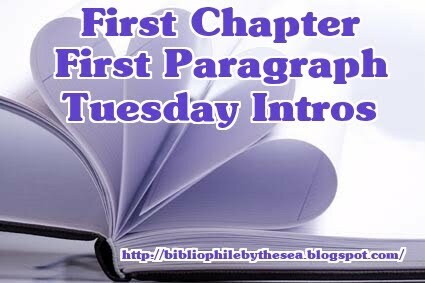 On Tuesday I posted the introduction to a book I had started and was loving. Well, I've finished it and please, let me warn you that you should not read it unless you are feeling so, so happy that you need something to make you feel miserable. As a matter of fact, you may feel guilty about being so happy and you immediately need to pick up this book to bring you down so strangers can stand to be around you again. Otherwise, skip the pretty language and the hopeful blurb on the back. I know. What was I thinking? It's French. Even their comedies are depressing. But the book jacket said Mathilde and Thibault were two lonely people in Paris. And we get to see that loneliness, that misery building block by block. Have things taken a turn for Mathilde? No. Back down again. Maybe Thibault will meet her in the subway. No, they missed each other. The psychic promised her life would change on the day the entire book takes place. But the blurb on the book jacket left the reader hopeful when it said, "a lonesome city... But what if these two could save each other?" It does say "what if..." which apparently in France means, they can't and they won't. So if you got your hopes up like I did, well, perhaps you skipped the part about it being French. Most of the book has a great languid quality about it. Yet, it made me anxious. Nothing much happens except lots of angst from both characters. And (SPOILER ALERT) in the end, they do see each other on the subway, look at each other, and when he looks up again, she has exited. He exits at the next stop and the book ends. I kept reading because I thought something in their lives might actually get better. Who wants the characters to walk away miserable? Apparently, the French do. So if you're incredibly happy, read this book. Or, if you're already feeling miserable and you want to feel like you have company, read this book. My poor feet. I know I expect a lot out of them. I take them for granted most of the time, and right now, they are getting their revenge. I went to the doctor last week to have plantar's warts frozen off my left foot. The doctor took a knife to my calluses before she could get to the warts. Then she looked at my right foot and started peeling away at a callus that had formed a sharp point. As we talked about the excruciating pain in my right foot, that only shows up a couple of times a day, she poked and prodded. She narrowed it down to a place right above my big toe joint. Probably a stress fracture, she said. "We could xray, but they don't always show up and then we'd have to treat it the same way anyway. Stay off it." So, with her advice ringing in my ears, I first determined to get a good pedicure and some new running shoes. I'm pretty sure my running shoes messed up my foot since they had "a little correction" in them, which I could use in my left foot, but not in my right foot. Then, as the excruciating pain showed up every time I slipped my foot in a shoe, I decided that maybe I should do something radical, like stop running for awhile. My definition of staying off it, might be different than my doctor's definition. I'm still walking a lot of places, and since I can't run, I started doing P90X every day. The difference is, I can do P90X barefoot, and I feel like that will help my foot. As a matter of fact, I spend most of my day barefoot now, trying to help my foot heal. When I go walking, I wear my Mary Jane crocs, which don't really touch my foot anywhere except the sole. For teaching, I've decided to go with a pair of Birkenstocks, again, mostly just protecting the sole of my foot. I'm hoping the return to nature will help my foot heal more quickly. But I do miss those morning runs, listening to the birds and watching the sun slowly rise above the city. The voice cuts through her sleep and hovers on the surface. The woman is stroking some playing cards which are face down on the table. She repeats several times with conviction: "On the twentieth of May your life will change." It would be enough to see them anywhere, in Toulouse, Barcelona or Paris, in any city at all, him stumbling on the paving stones and tripping over the kerb, unbalanced, caught out. At times like these she says: "God, you're so clumsy!" Then he'd like to say no. He'd like to say: "Before I met you I was an eagle, I was a bird of prey. Before I met you I flew above the streets and didn't bump into anything. Before I met you I was strong." I've gotta get back to the book.